1) Find the article you would like through the library's website. 2) Click on the the "Request this item through WorldShare" link located on the left side of screen. 3) This will direct you to the WorldShare login page, where you will log in to your account. 4) The article information will be filled in for you. 5) Click on "Submit Request" button, which is located at the bottom left of the page under the Copyright Notice. 6) You will receive an e-mail once your article is available and be able to access it through your WorldShare account. 1) Log in to your WorldShare account. 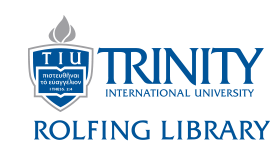 3) Complete the required fields, including your Trinity username (ex. zjsmith) and the "Need Before" date. 5) You will receive an e-mail letting you know that your article is available, and you will be able to access it through your WorldShare account.